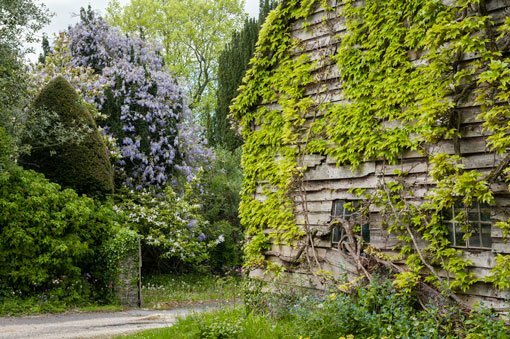 Situated in the green hills of the Welsh Marches, bordering Wales and England, the former home of Sidney Nolan (1917-1992) – The Rodd – still runs as an organic farm. 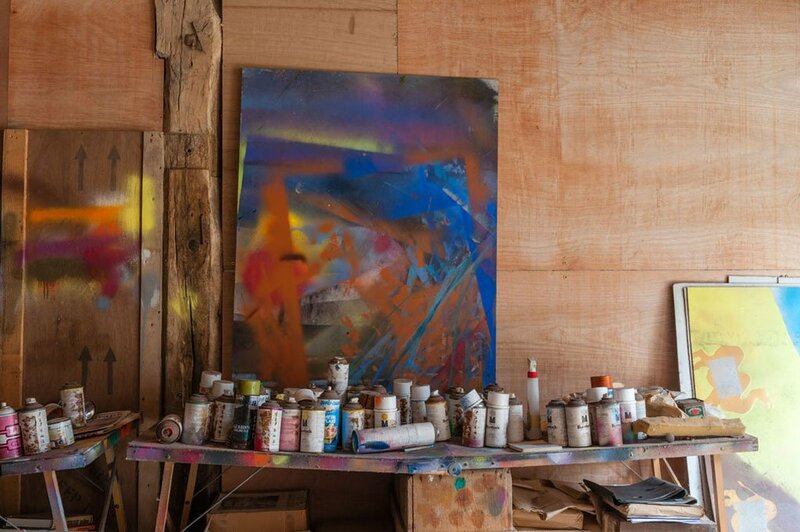 The land comprises fields, native woods, the original house and a group of ancient oak-beamed barns, where exhibitions and workshops are held and artists in residence work supported by the trust Nolan set up in 1985. Tourists are also found there, visiting the place where one of Australia’s most celebrated artists made much of his later work. Earlier this year I travelled to the UK for a two-month research residency in Nolan’s studio and to talk at the Royal Academy’s symposium to mark his centenary. 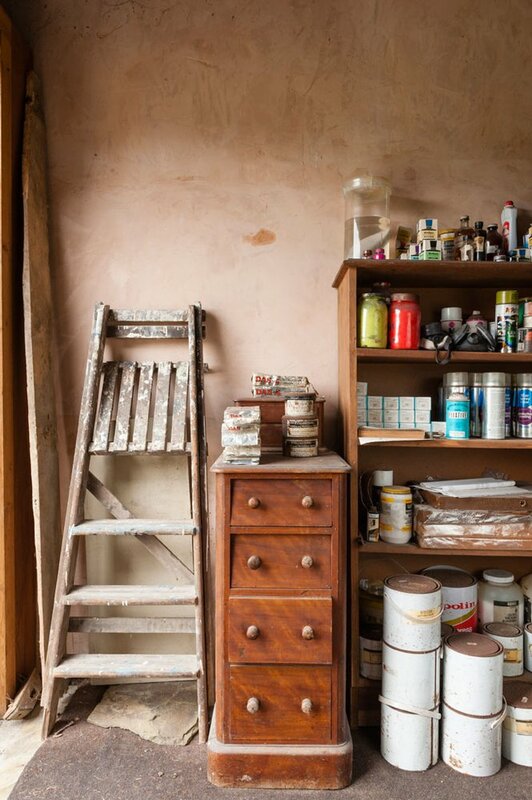 I had heard of The Rodd, Nolan’s last studio, while undertaking my PhD research on the Nolan’s use of house paint but I had not visited as, at that time, I was focused on the contents of another of his studios; in 2006, Nolan’s daughter Jinx had gifted the contents of her father’s studio in Wahroonga to the artists’ materials archive at the Art Gallery of NSW. 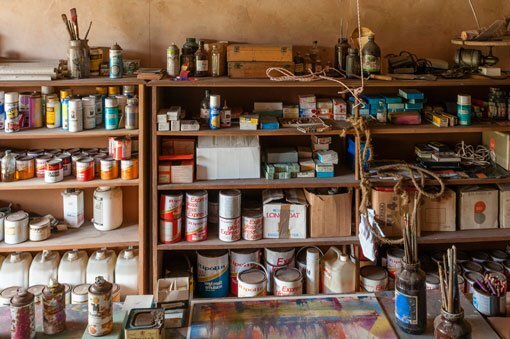 The Wahroonga collection of house paints, solvents and various handmade mixtures was a time capsule of his practice up until his departure for England and formed the core of my research. Nolan never lived permanently in Australia after he, his wife Cynthia and their daughter Jinx left for London in 1953, although he often returned for short visits. He had a successful London career through the 1960s but when, in 1976, Cynthia died, he left London to live in Herefordshire in the Midlands. Several years later he married Mary Perceval, sister of another acclaimed Australian artist Arthur Boyd. In 1983 Mary and Sidney purchased The Rodd. When the couple first moved in, Nolan had a room in the house where he worked. 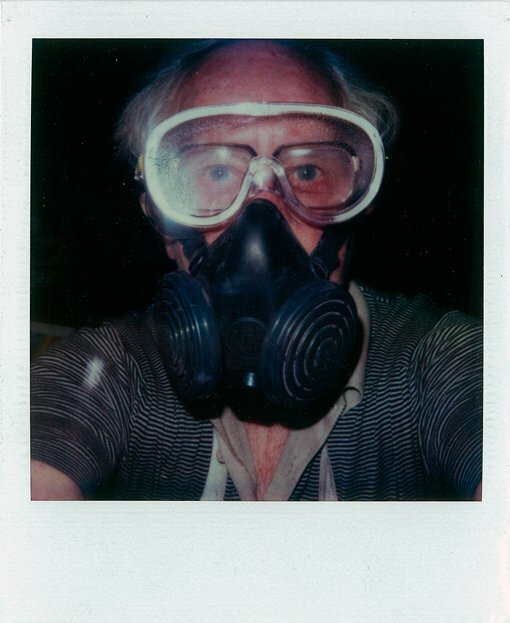 Although he used a mask and glasses, the toxic smell of his spray paints soon forced him out and into one of the barns. 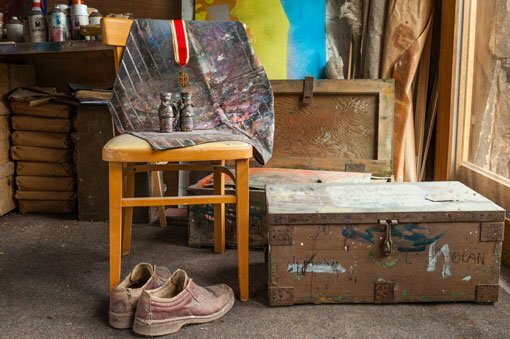 After her husband’s death on 28 November 1992, Mary Nolan kept his studio untouched in the hope that it would become a resource for researchers and a place of interest for visitors. 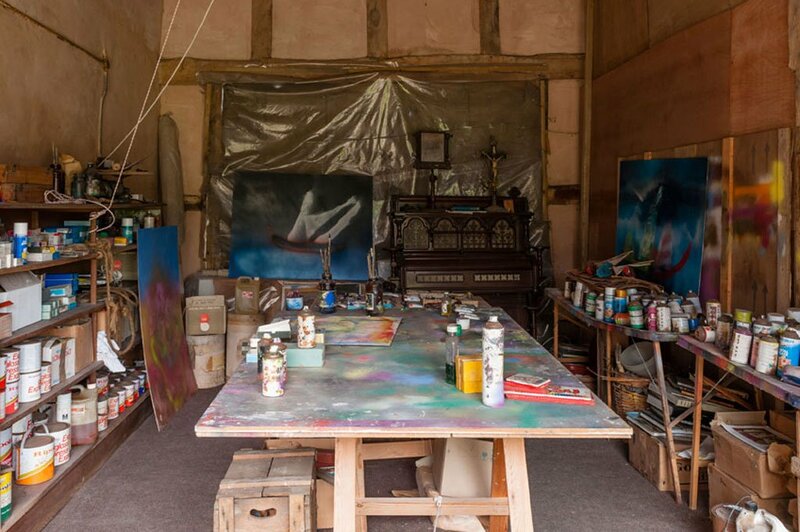 Last year I received an invitation from the Sidney Nolan Trust to undertake a research residency to document the contents of the studio and to begin the process of preparing the studio to be opened to the public for the first time as part of the planned centenary celebrations. Interestingly, Nolan never painted the picturesque surrounds, instead shutting out the view and painting under a strong mercury vapour light hung from the ceiling. 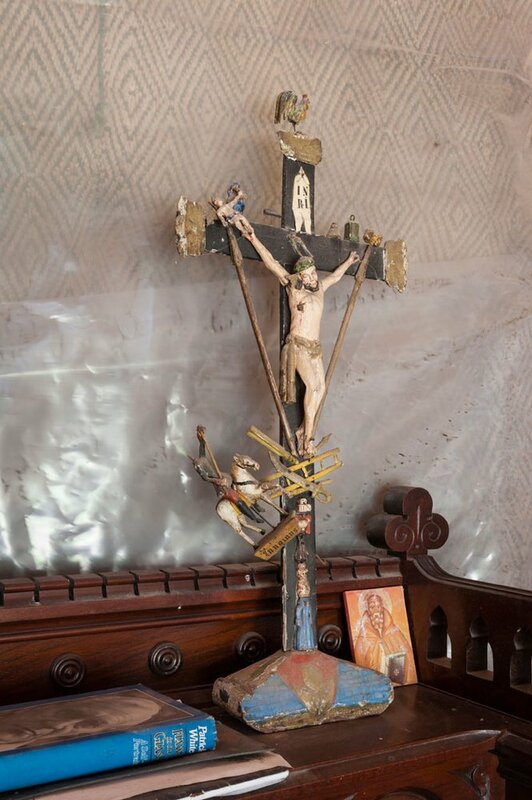 This light is still functional, but if it was intended to replicate the strong intense light of his home country, its colour would have cast a peculiar green hue to his paintings and must have been difficult to work under. 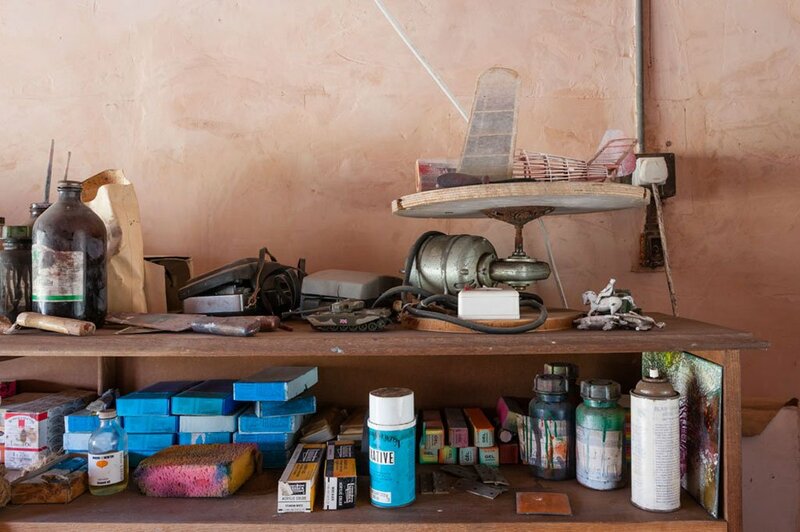 The small studio was both a storage space for Nolan’s large collection of art materials accumulated over 40 years, as well as his working space. It is, typically for Nolan, cramped and utilitarian, containing more than 2000 items (this I know because I inventoried, photographed and dusted each one over my two-month stay). 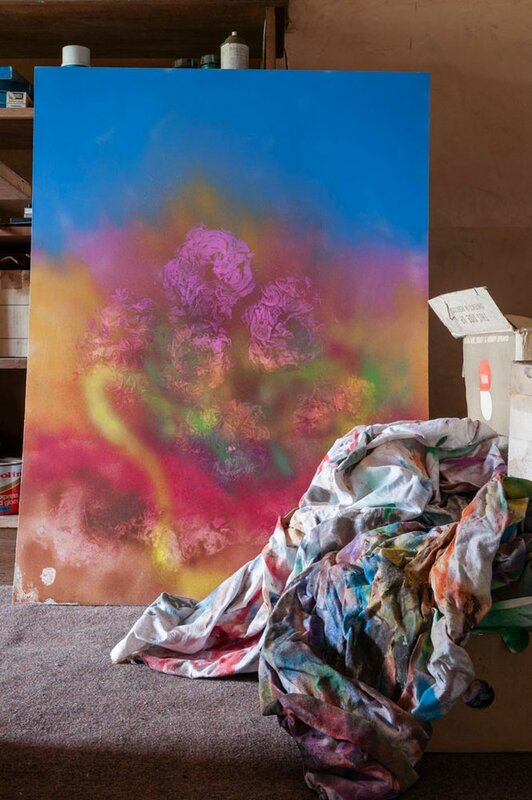 Among the studio’s contents are the brightly coloured and fluorescent German spray paints that the artist began using in 1982. Used alone, they have a matt effect, but Nolan appears to have often combined them with glossy clear sprays, which are also abundant in the studio. Nolan attempted to seal the space against the wind and cold by covering the walls in plastic. Some of this still lines the back wall, which is splattered with over-spray. Spray paint marks the painting crate lid, the tabletops and the cotton rags in a box under the main table. 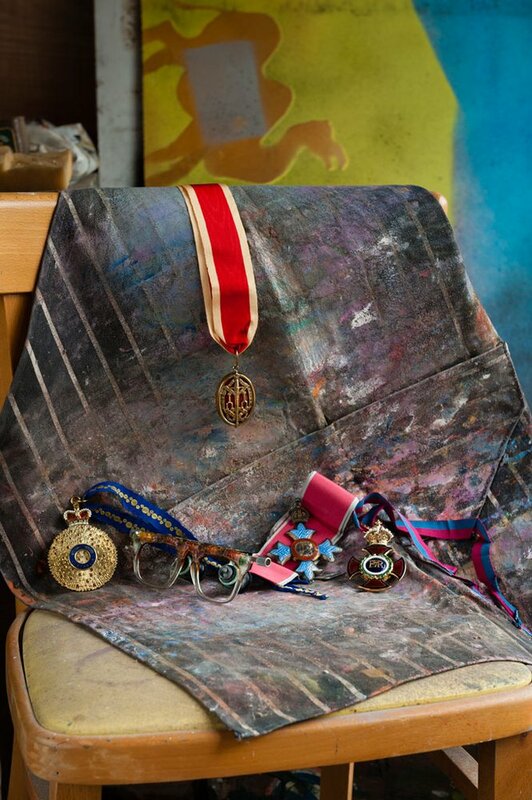 These rags were used as stencils on many of Nolan’s large abstract paintings from 1986, or dabbed into the wet paint for a textured effect. 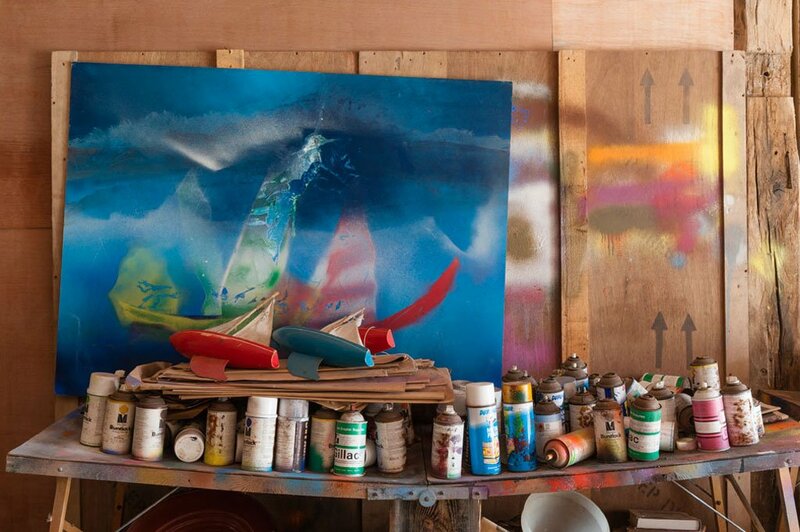 Nolan often worked on these larger canvases in the adjacent barn. Apparently, for the largest, he was suspended in a harness from the ceiling and pulled around by his assistant while spraying from above. Another box under the table is an old Vickers machine gun case from World War II that Nolan used to transport paints from Australia in the 1950s. 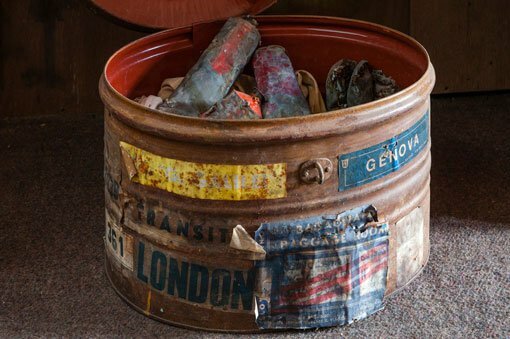 It contains some handmade paints dating back to 1941 in screw-top tins, a pre-war can of Ripolin enamel, rolls of film, spare light bulbs, and car parts for the Hillman Minx he and Cynthia had taken to Europe in 1950. A fast-working artist, Nolan liked painting materials that would dry quickly. Oil paints, which took weeks to harden, did not suit him. 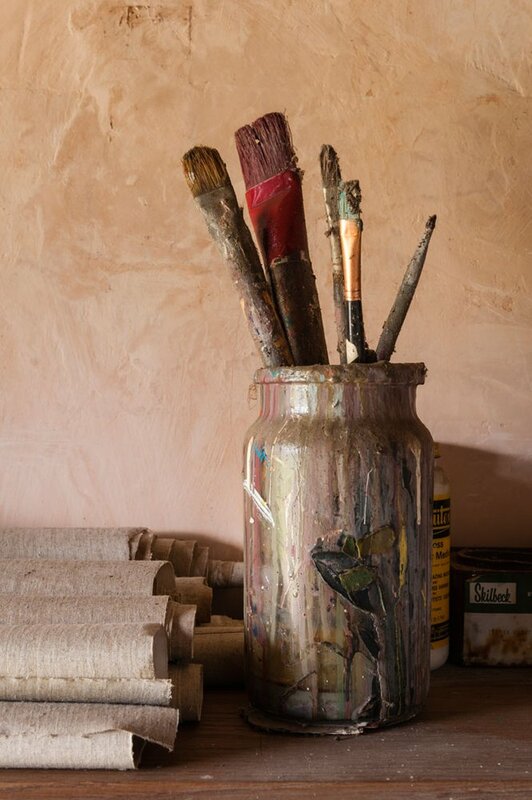 Instead, he preferred household and commercial paints such as Ripolin, a stock of which is on The Rodd’s shelves. These paints were fluid and needed to be applied on the flat surface of the table or floor to stop the paint dripping down the canvas. Nolan continued to work this way even when, later, he began using oils mixed with quick-drying mediums and there is no easel or room to work upright in this studio. 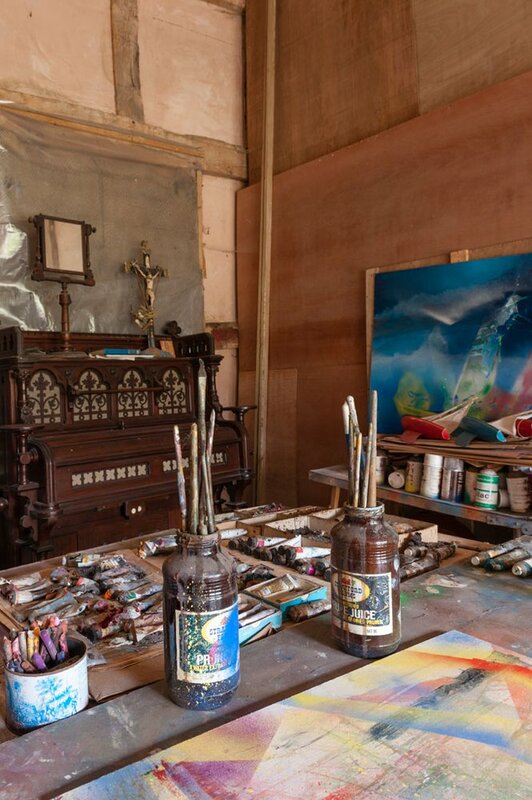 In an oval-shaped tin under the spray-paint table, Nolan kept large tubes of oil paint that were mixed by fellow expatriate Arthur Boyd and were probably a gift from Boyd to his friend and brother-in-law. A large stock of PVA and some coloured red and yellow dry pigments also occupy shelf space. 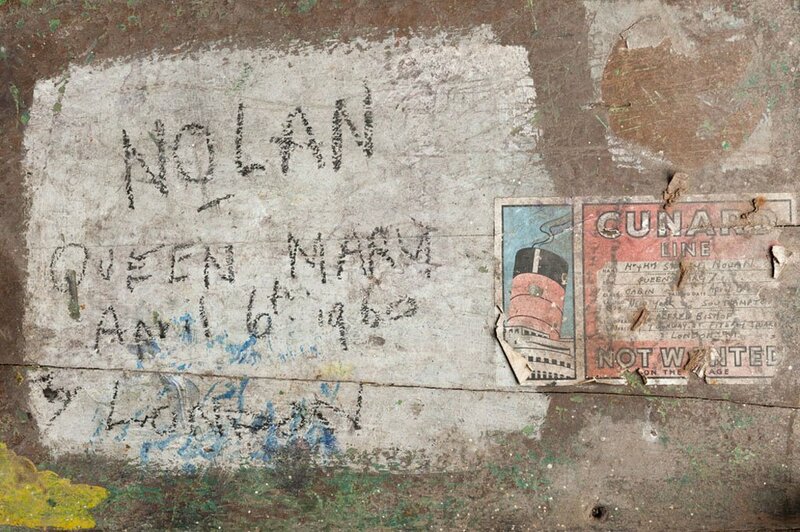 In the 1950s, Nolan was among a small group of artists who began mixing the new ‘white glue’, polyvinyl acetate (PVA), with coloured pigments. 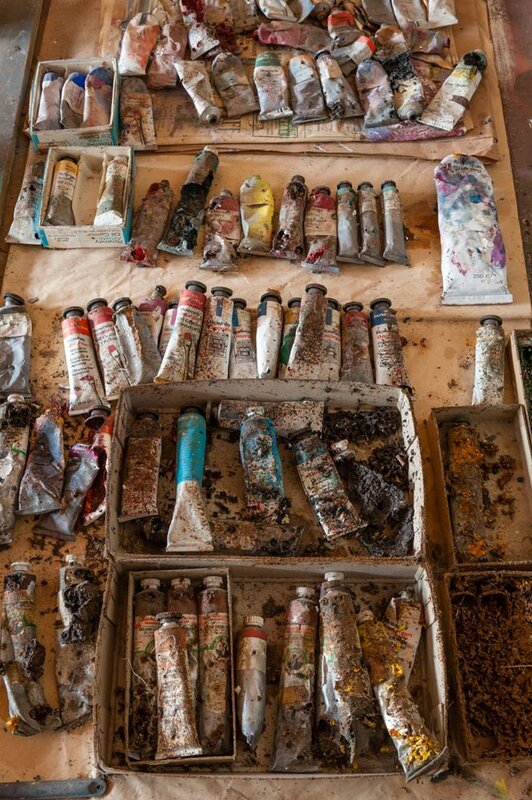 Mixing dry pigments into such a fast-setting medium must have been difficult and so Nolan began using wet pigments, of which there are several types in the studio. With two weeks remaining in my residency, the studio opened to the public on a fine summer evening, a considerably less dusty space than when I arrived. I left with more than 200 paint samples to bring back to Australia to continue my research into Nolan’s experimental use of materials. 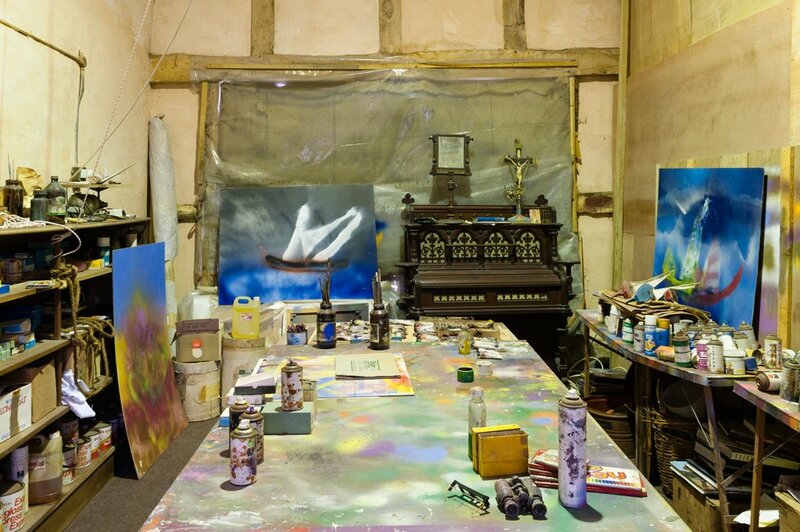 You can browse a slideshow of photos taken in the studio by Alex Ramsay. Click on one of the small images to begin. 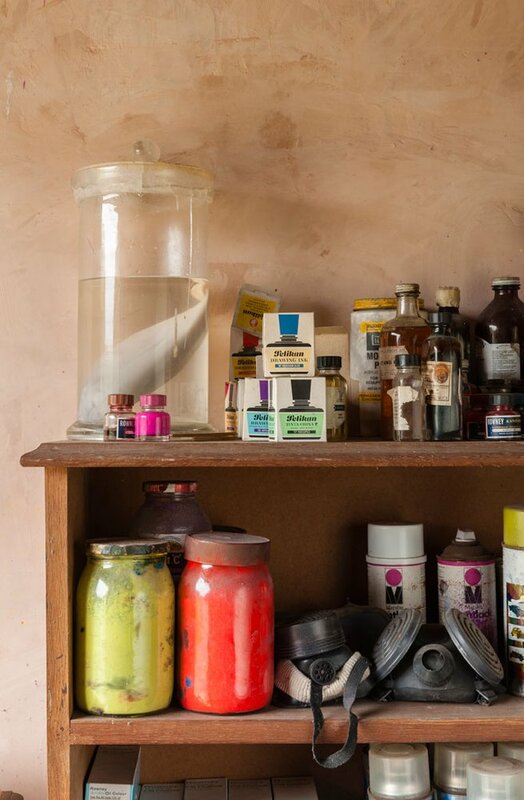 Dr Paula Dredge’s research residency was supported by the Art Gallery of NSW, the Sidney Nolan Trust, the Gordon Darling Foundation and benefactors Rowena Danziger and Ken Coles. A version of this post originally appeared in Look, the Gallery’s members magazine. All images reproduced courtesy of the Sidney Nolan Trust.